East Indies aster is a mat-forming herbaceous perennial native from India to western China. It is a member of the Asteraceae family that also includes sunflowers, yarrow, and lettuce. The plants form rosettes of dark green leaves that are three to four inches long, elliptical, and softly hairy. In summer strong leafless stems that never need staking produce solitary two inch wide flowerheads two inches across that consist of drooping violet rayflowers surrounding a center of orange disc flowers and are attractive to bees and butterflies. The plants are stoloniferous and can form substantial clumps but are not long lived in warm climates. A good choice for borders, containers, butterfly, rock and cutting gardens. 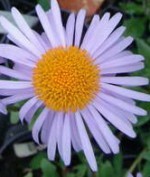 The generic name Aster is the Ltin word meaning star and refers to the form of the flowers. The specific epithet tongolensis means referring to Tonga , a Polynesian sovereign state and archipelago comprising 169 islands. Bloom: Solitary two inch wide flowerheads two inches across that consist of violet rayflowers surrounding a center of orange disc flowers in summer. Care: Divide every two to three years to retain vigor.